A leading City figure has been stabbed to death in his home during a burglary. Legal and General bond dealer John Monckton and his wife Homeyra were attacked by two men in Upper Cheyne Row, Chelsea, west London, on Monday. Mr Monckton, 49, died in hospital and his wife is recovering from emergency surgery. Their nine-year-old daughter, who was in the house, called police. A post-mortem examination at Westminster Mortuary gave the cause of death as stab wounds. 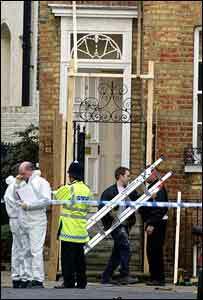 Scotland Yard said the men forced their way into the home of the couple at about 7.30pm. They then ran off in the direction of Glebe Place, near the Kings Road. Mr Monckton's family released a statement describing him as an "incredibly gentle and thoughtful man". It continued: "The Monckton family is profoundly shocked by the murder of John Victor and the attack on Homeyra. "Obviously our thoughts are very much with her and her children. Officers have been studying CCTV footage, carrying out forensic examinations of the three-storey town house and door-to-door enquiries. Mr Monckton was a cousin of Rosa Monckton who was a close friend of Princess Diana. The couple also have a 12-year-old daughter who was not at home during the attack. Houses in the street where the Moncktons live sell for more than £3m. It has had a number of famous residents such as former Rolling Stones bassist Bill Wyman. Colleagues at Legal and General paid tribute to Mr Monckton who was a director within the firm. Tim Breedon said: "John had a great intellect and was a man of the utmost integrity and kindness. "I will miss his support, his contribution and his dry wit." The borough's police commander, Ch Supt Dominic Clout, said: "I have got a community in shock. This is a tragic, tragic murder." He said he wanted to reassure the community he would be working hard to catch the killers. Det Supt Mark Jackson, who is leading the inquiry, said Mrs Monckton would be interviewed when she had recovered. Police are appealing for anyone who saw them, or anyone acting suspiciously, to come forward. The two suspects are described as being 5ft 3ins to 5ft 6ins tall.